Field Blower (Guardians Rising, 125/145) blared into the meta in the Guardians Rising expansion set back in May. I originally had this as my number one card in the set. This card was The Chosen One – it would end the reign of Garbodor (Breakpoint, 57/122), bringing its tyrannical dominance to a finish. No longer would we be forced to submit to the power of Garbotoxin. No longer would we have no choice but to suffer under the oppression of ability lock. Now we could fight back against the dominion of Garbodor and actually play ability based decks. You only use two at most Lele in almost every game. At Memphis, the average Lele count of the top 32 decks was 2.21875. 170 has become the new 110. I saw plenty of OHKO’s on Tapu Lele on stream this past weekend. I can’t think of a meta deck that doesn’t have the ability to OHKO Lele under the right circumstances. Lele does you no good if Garbotoxin is activated. Which brings me to my next point: the average Field Blower count at Memphis was 1.3125 per deck. I’ve said this a number of times: if you’re running an ability based deck (and don’t tell me you’re not because well over 90% of the decks I run into on PTCGO play at least one Pokemon with an ability and NONE of the decks at Memphis were ability-less) and you’re NOT running four Field Blowers, don’t go crying that you couldn’t beat Garbodor because you couldn’t find your Field Blower or that you didn’t have enough Field Blowers because the opponent’s Garb deck ran four Float Stones. I’ll bet a dozen doughnuts that we’ll see a whole lot more BKP Garb at Leipzig and Sao Paulo if people keep running one – or none – Field Blowers in their decklists. I saw it myself a short while ago when I played a string of forty matches with Grampa – there were a number of times that I sat there and watched my opponent’s Zoroark deck helplessly squirm in frustration as it top decked non draw support cards while they were unable to cast off the bonds of Garbotoxin. And especially now that we’re seeing so much less GRI Garb, players are running tons of tools. Decks in Memphis ran an average of 4.4375 Tools in their deck lists. Only one deck didn’t run any Tools (as you probably guessed, the stall deck). Field Blower helps with more than just Garbotoxin. Players ran an average of 2.40625 Choice Bands alone. That’s an extra thirty damage every time they attack with that Pokemon. You can’t do anything about the first time they play Choice Band, but who wants that extra thirty every time? And decks in Memphis averaged 1.15625 Stadiums per deck as well. Honestly, right now, there are plenty of reasons to run four Field Blowers. I mean, come on it has not one but TWO nicknames (Leaf Blower and Trashalanche Fuel). A card with one nickname HAS to be good. A card with two nicknames? That’s a card that should be averaging more than 1.3125 cards per deck. And if you think I’m crazy and don’t know anything about Pokemon, go count how many Tord ran in his decklist back in London… and he ran four Puzzles in that list as well! What’s much to say about out sixth best card of 2017 and the second best card of Guardians Rising? Field Blower does it’s job well, regardless of what deck you’re playing. It removes up to two cards that are Pokémon Tools or Stadium cards. That is enough to make almost all passive tools and stadiums nearly unplayable because it helps your opponent more than you. The tool removal can fuel up Garbodor’s Trashalanche damage output. Also, if your deck doesn’t use Stadiums, but your opponent’s Stadium card is hurting you, then Field Blower is your answer to getting rid of it. Other than being a disruption card, it is also another answer to dealing against Garbodor’s Garbotoxin ability since that still brings ability reliant decks a screeching halt. Then you can enjoy using abilities once more! Today, I’m taking another look at Field Blower, which is an item card that discards up to two in any combination of Pokémon Tools and/or Stadium cards from either player. It was reviewed twice: one as the second best card of the set (https://www.pojo.com/COTD/2017/May/6-2.shtml) and one as the sixth best card of 2017 (https://www.pojo.com/field-blower-top-10-pokemon-cards-of-2017/). As this is a card that was already reviewed before, I can hope that players will already know what Field Blower can do for you. Whether or not Field Blower has seen varying degrees of play or not, it exerts a huge influence on the format that we’re in. Want to play passive Tools and stadiums for specific decks? Well, the very existence of Field Blower will make you think twice. The fact that Field Blower can be played from any player (you or the opposing player) right away due to being an item card will mean that passive Tools and Stadiums that require another player’s input to trigger the effect will never get activated. Passive cards like Sky Pillar, EXP Share, or Bodybuilding Dumbbells will be totally screwed by Field Blower, and it acts as if the Tool or Stadium card did not happen at all and becomes waste of deck space. Albeit rare, discarding Stadium and Tools may perform Knockouts if the Tool in question raises the Max HP. …until the next rotation happens. I don’t see Field Blower being on any other set besides Guardians Rising. And speaking about that set, in regards to Tools and Stadiums, there’s Choice Band and four other stadiums that you can get rid of, so Field Blower serves a purpose in the Limited Format, if you run into any of them. Conclusion: Tool and Stadium removal are helpful of getting past an obstacle that you might stumble into and not get past it. This was very problematic back in the formats where it was XY Primal Clash-on and XY BreakThrough-on where Garbodor’s Garbotoxin was shutting down abilities as long as this Pokémon has a tool attached to it. Field Blower was an effective strategy of removing that obstacle that brings many decks to a juddering halt. Even without Garbodor, Field Blower still sets its sight of removing anything it sees. Pokemon Tools and Stadiums are such an important aspect in any PTCG game and deck, as it can really help achieve many things; free Retreat, extra damage, energy redistribution, Pokemon search, draw power, disruption and of course interaction with Pokemon abilities and attacks. And what happened when that Pokemon lost its Tools because of something? Will their setup choke because of it, and you got the upper hand? Are you wishing that such a thing exists? Let me introduce you to the most powerful anti-setup card; Field Blower. The Leaf Blower, the 98 octane fuel for Trashalance. A staple in almost all decks, Field Blower allows you to discard any combination of up to 2 Pokemon Tools and/or Stadiums in play. So it can discard either 1 Tool, 1 Stadium, 2 Tools or the combination of 1 Tool and 1 Stadium. This is a great item that card turn the tide of a match, as said previously, as you can potentially ruin their game progression in almost any stage of the match. Removing their Choice Bands so they miss the KO and you get the heal the wounded back, removing their Float Stones so that they can be trapped by Guzma or Lycanroc-GX’s (SM GUR) Bloodthirsty Eyes (and also removing Garbodor (XY BKP)’s Garbotoxin lock), removing their Brooklet Hill so no Pokemon can be searched out, removing Parallel City so you can place 5 Pokemon again instead of 3, and so on and so forth! The possibilities are endless. All decks will want to use this, as it is so powerful in every situation and in every match. 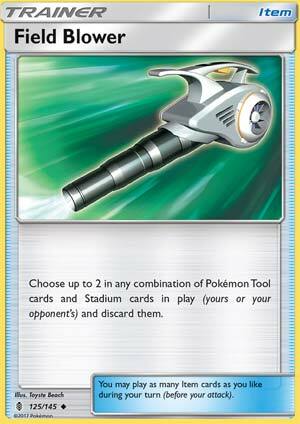 Against Garbodor, you want Field Blower to regain your Abilities back if they got a Tool on the Garbotoxin Garbodor. When playing and against EX and/or GX heavy decks, you want to remove Choice Bands to ensure survivability. Against disruption decks, you want to remove Stadiums so they don’t have access to Delinquent. Against big basic Water (Lapras-GX) or Fighting (Buzzwole-GX) decks you want their Brooklet Hill gone so they can’t leniently search out their Pokemon. The possibilities, as said before, are endless….. Overall, Field Blower is an amazing card that sees a lot of play and isn’t affected by power creeps. It just does what it does and it did it very well. Kudos to the blower. Finishing off the first week of our Top 10 Cards of 2017 countdown is the sixth-place finisher, Field Blower. It appeared on three out of the four personal top 10 lists submitted by the reviewers, amassing 34 voting points. What makes a Trainer-Item that allows you to discard up to two Stadium or Tool cards or one of each from the field, regardless of who owns those cards, so important? The competitive cardpool, of course. It can be easy to take having such a card for granted, even though; Stadium and Tool cards weren’t even part of the original game mechanics. We’ve always been able to discard a Stadium by playing a different Stadium card, but we haven’t had a Trainer-based method for discarding Tools for approximately a third of the game’s history. If you are focused on Trainers that don’t use up your attack, it is actually only about half. The first card to easily discard Tools was Windstorm, and it’s just Field Blower by another name. It also didn’t show up until 2006 and was only legal for two Standard Formats (possibly barely three, as it officially released a day before rotation). After that, there’s a gap until Tool Scrapper released in BW: Dragons Exalted, allowing players to discard up to two Tools in play. That would about six years after Windstorm released and about four years after Windstorm left Standard Format play. It varied from being a loose to an actual staple. A few months shy of two years later, while Tool Scrapper was still Standard legal, Startling Megaphone released. It could only discard Tools on your opponent’s side of the field, but it discarded all of them, and so was often preferred to the more flexible Tool Scrapper. Six months later, Xerosic gave us a Supporter that could discard a Tool or Special Energy (not both) attached to any Pokémon in play (again, either player). Sometimes it was preferred to Startling Megaphone, and sometimes a deck wouldn’t use either of them… and then we got to the 2016-2017 Standard Format. We suddenly had no Trainer-based method to discard an opponent’s Tools, but we still had many easy, potent combos built around Tools. Exp. Share for Energy retention, Fighting Fury Belt for an HP and damage increase, Float Stone for a free Retreat Cost… in some ways, it was refreshing that you could rely on these Tools. We also had (and still have now) Garbodor (XY: BREAKpoint 57/122) and its “Garbotoxin” Ability, which completely shuts down Abilities. Garbotoxin isn’t always worth it, but we learned from Garbodor (BW: Dragons Exalted 54/124; BW: Plasma Freeze 119/116; BW: Legendary Treasures 68/113) that it often worth a 1-1 or 2-2 Stage 1 Evolution line, plus running a few extra Tools (preferably Float Stone) to cripple Ability reliant decks. Sometimes, the metagame will shift so that it no longer remains a good deal; Abilities that aren’t quickly used the first turn become rare or a different anti-Ability approach becomes more effective. Most of the time, though, this shapes the rest of the metagame. The only good counter we have to this is… Field Blower, which released back in May of this year. If a Standard Format deck relies on Abilities, a deck wishes it could max it out, but settles for two or three copies. Even a deck that lacks Abilities likes to include Field Blower; it is an easy two-for-one in most matchups. Recent tournament results are mixed. It might make do without, however. The Expanded Format still has access to Startling Megaphone and Xerosic, and sometimes they are better options than Field Blower (Tool Scrapper is totally obsolete, however), or may even be used alongside it. Though Puzzle of Time is Standard Format legal, it seems more popular in Expanded – probably because of the specific decks being used – and that (plus VS Seeker for Xerosic) allows decks to reuse their Tool discarding effects if needed. In turn, that means a deck can get by running fewer copies than something similar in Standard. Except, of course, decks that already were running zero or one copies. SM: Guardians Rising only has one Tool but it has four Stadium cards, so Field Blower is a good pull here, probably a must-run. If it isn’t clear, I think quite highly of Field Blower; it was my third place pick, nearly my second. Without Field Blower, the metagame would be radically different, more like the first half of the 2016-2017 Standard Format. Field Blower bounces back and forth between loose staple and true staple nearly all decks, and its hard to top that… and if it wasn’t for Garbotoxin or some of the more potent Tools, I’d be annoyed that they released something that hurts so many Tools. this Item has a lot of power, since it can get rid of not only Stadium cards but also Tools. Not only can you knock out your opponent’s Stadium with ease, but you can also remove their useful Tools like Choice Band and Float Stone easily too. This can hamper your opponent’s strategy while you promote your own, and it’s a very good card to have in Stadium and Tool-heavy formats. The number you run in each deck may vary based on the space it takes up, but I think 2 is a pretty good number as a start.